As if 5 days of the annual Paris Salon du Chocolat wasn't enough. 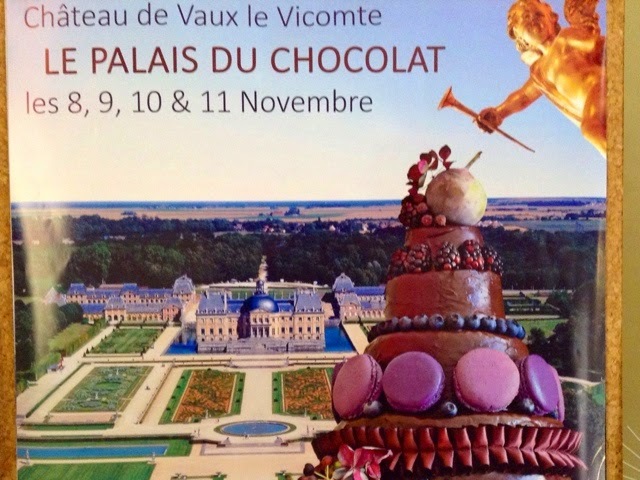 The following weekend beginning of November along comes the chocolate salon at chateau Vaux le Vicomte near Melun. Naturally I couldn't disappoint you by missing it could I? And bear said he'd like to attend. The weather was sunny and lovely and not the least bit chilly. Because of Remembrance Day on Tuesday, the chocolate salon was extended to 4 days. 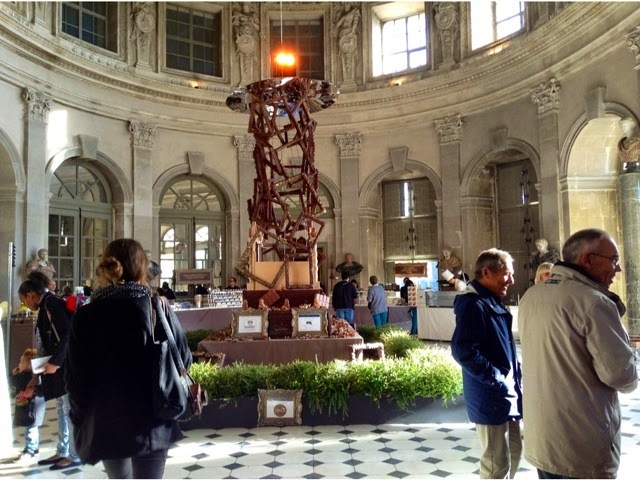 It's just a 35 minute train ride from Gare de Lyon and a quick hop on the chateaubus. Please add this to your extensive lists of Don't Misses PBers. After all former owner of the chateau, Comte Nicolas Fouquet would be very disappointed if you didn't partake. I wonder what he'd think of the salon but then he adored giving grand soirées so he'd probably be first in line for the hot chocolate. If you'd like to see the chateau in its glorious hey day rent the costume film VATEL with Gerard Depardieu. Very grand indeed. There were a slew of top chefs in the grand ballroom and as always an outrageous chocolate sculpture. OK several outrageous chocolate sculptures. 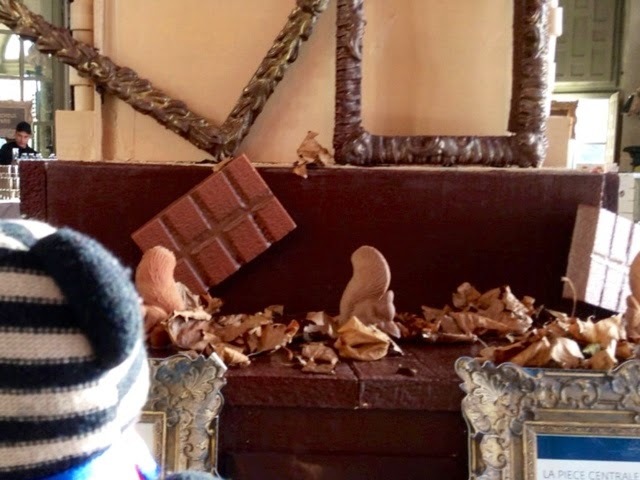 Bear had to get up close to study Vaux le Vicomte's symbolic squirrels in chocolate. Jean-Charles Rochoux was there as always with his mother. I, with the best of intentions, bought a little box of his heavenly chocolate ganache truffles for my concierge. Which...ahem...I just wolfed down. Fortunately his tiny shop is nearby in the 6th so I can easily replace them. 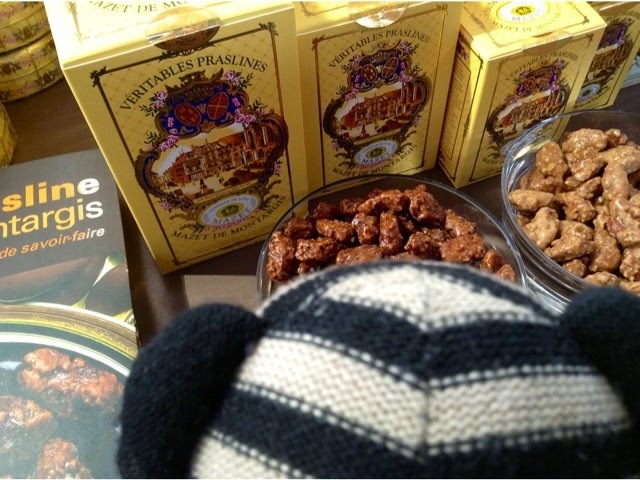 Bear loves Mazet's almond dragees. It was all I could do to keep his paws out of the generous tasting bowls of candy. 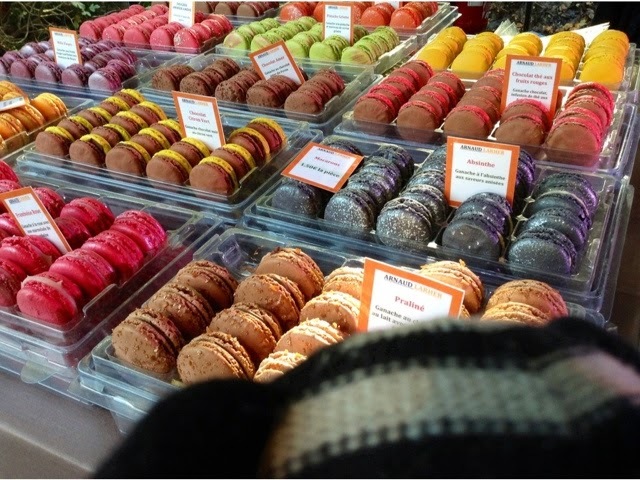 We both are crazy for Arnaud Larher's macarons. 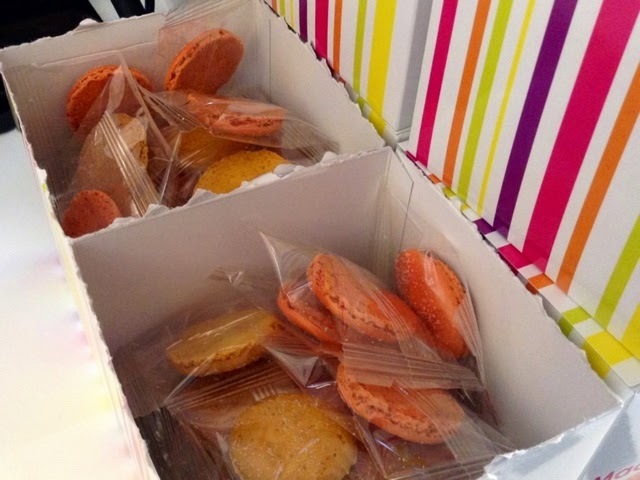 I got citron and mandarin macarons. 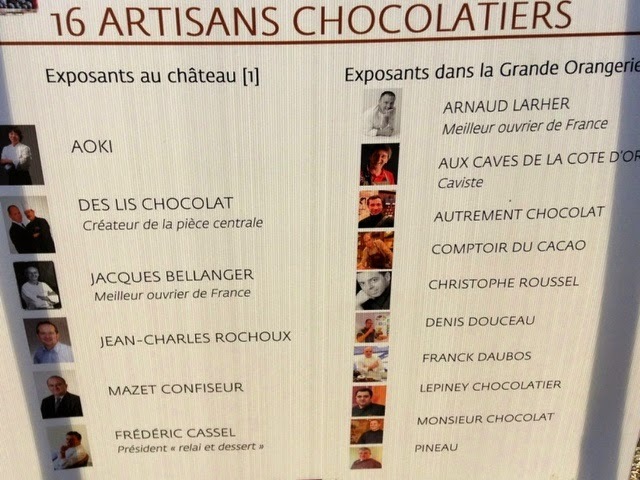 Here's the list of excellent chefs taking part at the chateau (most show up every year). Fewer than the big Paris salon but oh so much more manageable. 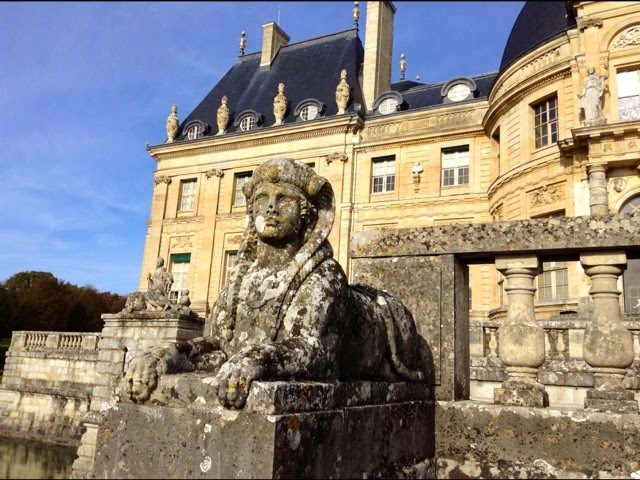 Just as the chateau is a mini version of Versailles designed by the same architect, Louis le Vaux, landscaper, Le Notre and interior decorator, Charles Le Brun. A wonderful day outing for the family or singles. Starting 29 of November the chateau will put on it's annual Noël fete. I hope to make it this year. Of course there are some chocolate gowns to ooogle..
Can there ever be too many chefs stirring the pot when it's a pot of hot chocolate? A nearby pastry school, Antoine Careme always does demos and classes for the little ones at the salon. This is when I'd like to drink Alice's potion and shrink down to pint size. Kids have a ball in France. Not that I'm complaining at all. *Here's a tip I've finally figured out after visiting many of these salons. 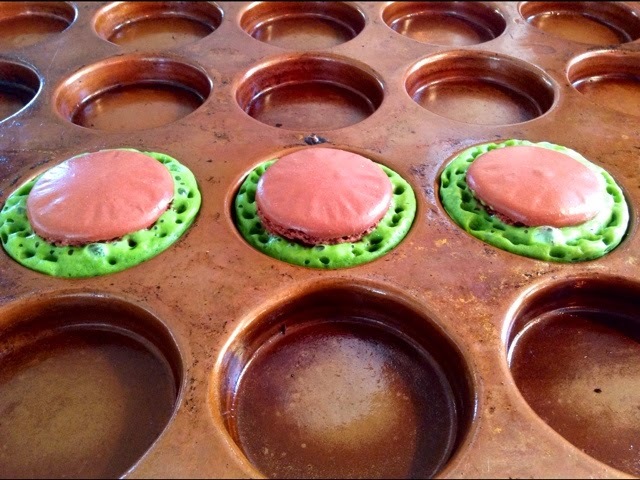 Buy what they are making onsite, like Aoki's Tokyo macaron Yaki or the hot chocolate. These items are freshly made and usually reasonably priced for feeding the masses. You simply can't go wrong. Hope to see you there next year PBers! Oh wow. I must again bow down to your stamina. What a great event in beautiful surroundings, and on such a lovely day. 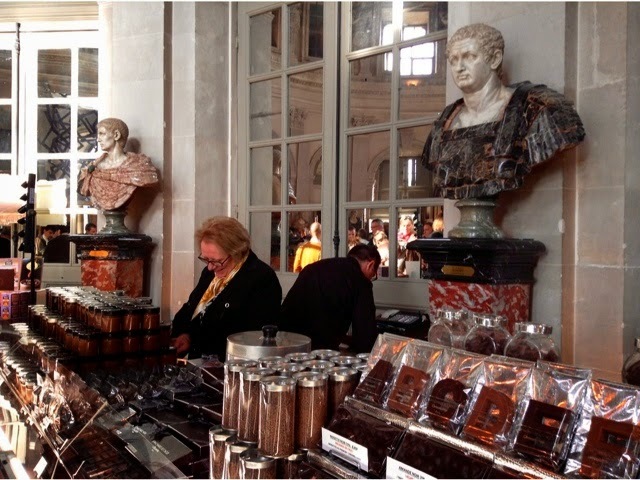 Chateaux Vaux Le Vicomte is still on my wish list- even more so now that I know that they do a Palais du Chocolat. And again I'm sorry that I didn't buy one of Aoki's green tea macarons in Paris, I stood and watched him making them.... It's one of the beauties of Paris I suppose there is always so much more for next time. I certainly haven't had my fill after 4 visits. Saw Vatel..I love GD in movies. Your top collage w/ la fontaine au chcolat..squirrel etc..Charming. Funny..you identify with the grandparents and I wanna be the kiddie. Carol thank you for sharing your experience with us! 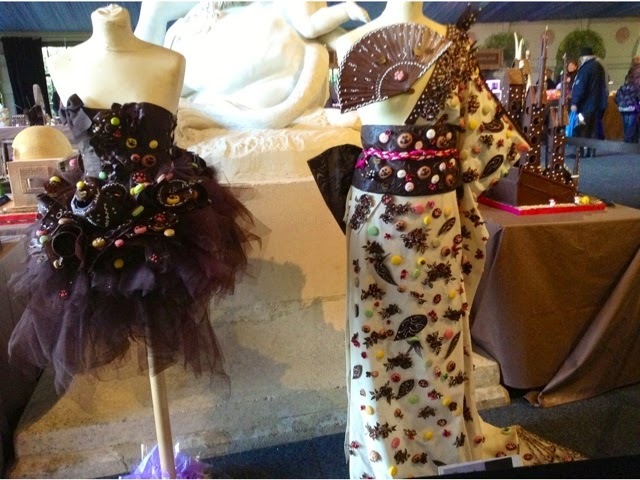 I loved the chocolate dresses - just delightful! I, too, love/ the chocolate dresses. And merci, for the heads-up on the Noel celebration there. I love Bear-he is so enigmatic, it is difficult to imagine what all those thoughts are in his darling little head. They must be very sophisticated and fashionable thoughts since he resides in the capital of Chic. Wonder if he wishes for Chocolate? Bear does have that elusive 'je ne sait quoi' quality. He does ADORE Chocolate btw. Great to seeBear out and about again. He has very good taste. Looks really delicious and the Chateau has been on my must do list since I started planning my trip in May. They do a terrific Easter weekend too. Love this post, Carol. Thank you for it. Also love seeing Bear!! Treat of treats today. Putting this on our list of must-sees. Your recent chocolate posts have me wishing for a return trip. I can smell and taste those delicious chocolate goodies through the screen. Thank you for taking us along on this chocolate adventure. P Bear is a lucky guy! Good to see Bear, too! Missed a few posts due to uncooperative device. 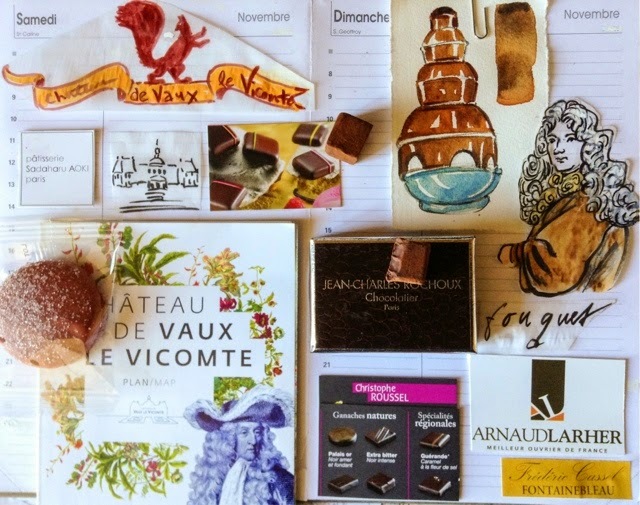 How wonderful to begin reading backwards with chocolate and a chateau! My must do list is quickly getting out of control! Yours is my fav blog EVERYTIME. I so love it. 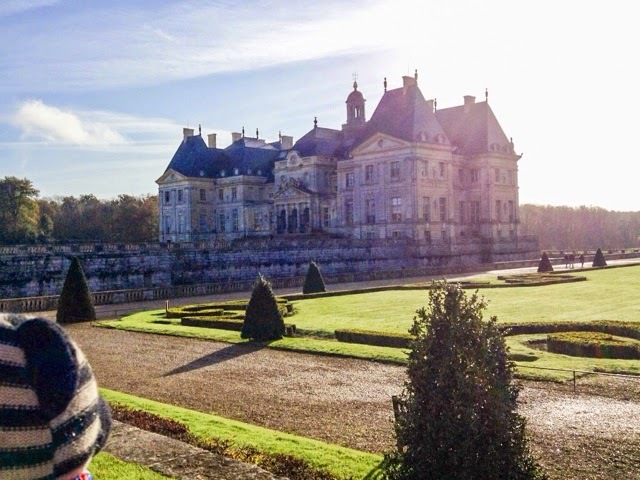 I also adore Vaux-le-Vicomte, so I have to comment : ' Just as the chateau is a mini version of Versailles designed by the same architect, Louis le Vaux, landscaper, Le Notre and interior decorator, Charles Le Brun.....". 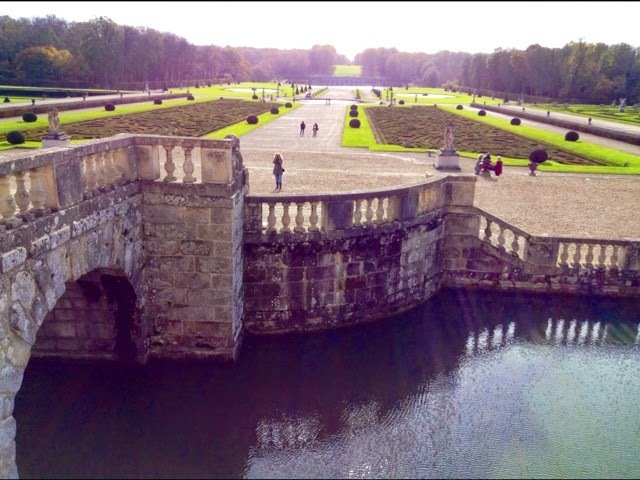 Well Vaux was built BEFORE Versailles. The story is fascinating. Louis 14th (in a potted history) put Fouquet in prison, took his chateau and his Vau, Le Notre and Le Brun and told them 'build me something bigger'...which is Versailles. 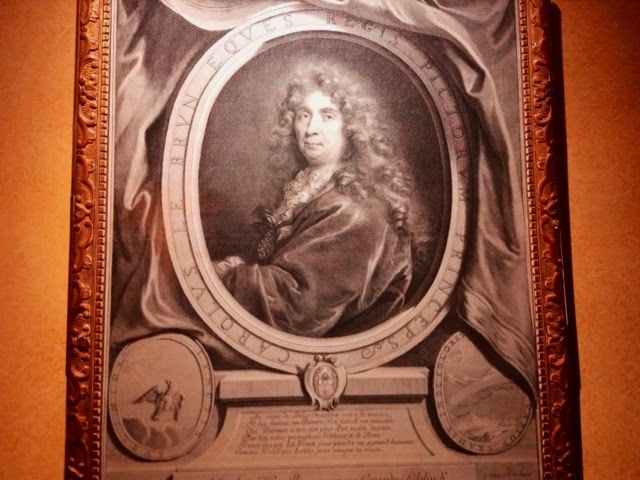 And your portrait is of Le Brun, not Nicolas Fouquet (or Foucquet). I wish I could back there just one more time.....Kind regards and thankyou. Gwendoline Blake en Australie. I've always Loved Le Brun so I dont mond a bit on that count. I know very well the story of Fouquet and Le Vaux. I am lucky enough to be living in a Le Vaux hotel particulier built around 1640... Le Vaux cut his eye teeth on Ile Saint Louis before venturing forth to VLV,Versailles and the Louvre. Very lucky. Keeps me on my toes. I copied the signature and thought it was wrong. Wonder why they have dropped the other C? Oh my. 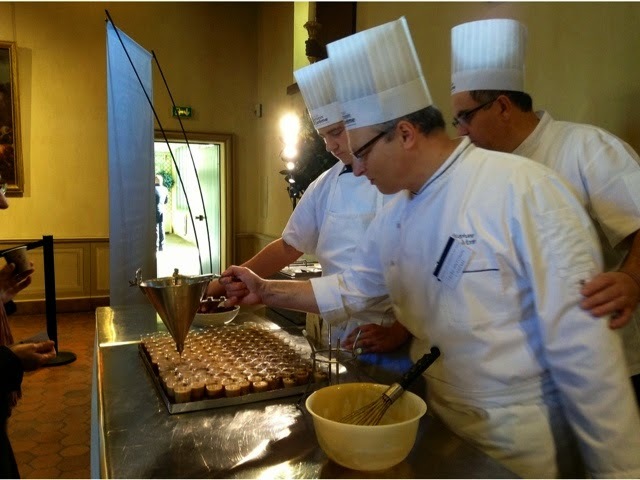 Chocolate and macarons in a chateau - it doesn't get much better than that. Except, of course, when Bear is along for the excursion! 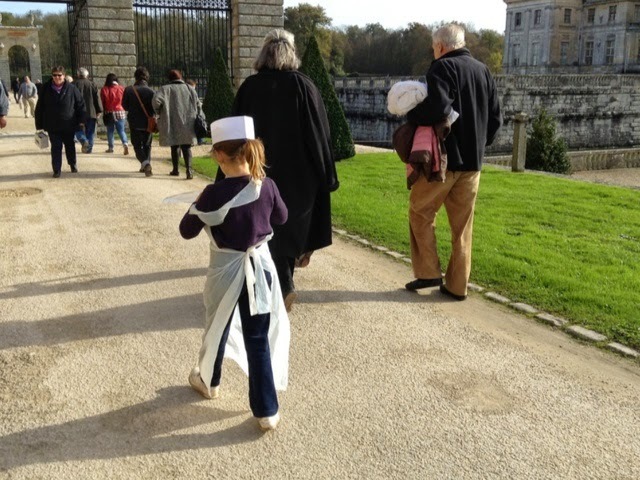 I love Vaux le Vicomte. To be there with chocolat -- sigh!